Click here to download the Slow ’N Sear® Lighting Instructions sheet in pdf form. Unless otherwise noted, all temperatures listed are in degrees Fahrenheit, and “charcoal” or “briquets” will refer to Kingsford Original Briquets. Any charcoal substitutions, such as lump or other brands/types will likely yield differing temperatures and times from what we provide as a baseline. Use any substitutions with caution. “Chimney” or “charcoal chimney” refers to the standard sized Weber charcoal chimney starter, for volume consistency. Other products/brands may have varying amounts. Place a chimney starter cube near one corner of the Slow ‘N Sear and light it. (You may find it helpful to place a small square of foil on the grate to set the cube on.) Once lit, add a dozen briquets around & on top of the starter cube, with the briquets tucked fairly tight into the corner. Leave the lid off and the bottom vents open. Make sure any ash from previous cooks is cleaned out to allow for good airflow. Starter cube may snuff out without proper airflow. Wait about 15 minutes, or until the smoke dies down and the coals are well lit. Then, add a full chimney of unlit briquets to fill the remainder of the charcoal basket. 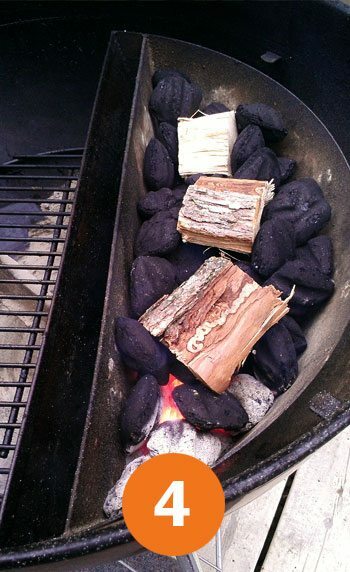 Add a few chunks of smoking wood spread out over the top of the charcoal. Do not heap too full or the food grate will not fit properly afterward. Add 1 quart hot water to the reservoir, pouring from the unlit side of the water reservoir. Please wear eye and hand protection. NEVER add anything other than water to the water reservoir! Scroll through the gallery above to see images from each lighting step. You can play on these options to whatever suits you and your weather conditions, but a great rule of thumb is to start with about a dozen well-lit briquets to a full chimney of unlit, for 8+ hrs of 225 F.
Add 1 quart hot water to the water reservoir, which will fill it approximately 3/4 full. For best results do not fill full. Please wear eye and hand protection! Place your leave-in digital thermometer probe in place on the indirect side (cooking side), opposite the Slow ‘N Sear, about 1″ above grate level. Please do not use the grill’s lid thermometer for temperature monitoring! Do not leave an instant-read thermometer in the grill. If your kettle grill has the top lid vent off to one side, place the lid on the grill securely with the lid vent positioned opposite the Slow ‘N Sear. This will help draw the hot air over the grate and the food. Open the top vent fully and the bottom vent about halfway. The temp will slowly rise as the grill, its components, and the water in the reservoir begin to heat up. When the temp at grate level reaches ~150 to 175, close the top vent to about 1/3 open and the bottom vent to about 1/4 open*. Continue to monitor the temperature as it nears 225 and close the top vent as needed to hold 225. *Click here to see a visual of the handle positions relative to the vent settings on the 2015 Weber Original Kettle Premium. *Note: some prior inspection may be necessary with your grill so as to know the bottom vent positions relative to the sweep handle on older Weber One Touch kettle grills. This will be very necessary to know for proper temperature maintenance as the cook progresses. When cooking hot & fast @ 325 such as with chicken, we do not need to fill the charcoal reservoir full of unlit briquets. Instead, begin by using 1/2 of a chimney of briquets (approximately 40 briquets). Light them all, however you choose, and let them burn for approximately 10 minutes. A good indicator when they’re “well-lit” is when the blue smoke begins lessening or is gone completely and heat waves are visible from the top of the chimney. This is easier to notice from afar than relying on the “ashed over” appearance of the coals themselves. 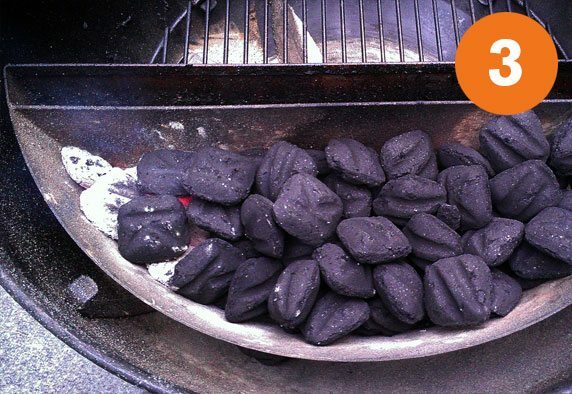 Add only these coals to the Slow ’N Sear’s charcoal reservoir, spread out evenly. Do not use any unlit briquets for cooking chicken, as the cook time is relatively short and extra coals are not necessary. When doing a longer hot cook such as for a turkey, we recommend doubling the total charcoal. 90 minutes of 325+ will likely not be enough to properly finish a large turkey, which may take 2-3 hrs depending on size. Add half a chimney (~40 briquets) of unlit coals to the Slow ‘N Sear first, then add the half chimney of well-lit coals on top. This will give you more firepower, more longevity for a longer cook. This method will also be helpful in colder weather where charcoal use will naturally be increased to maintain temperatures. You will likely have a lot of coals left over after your cook is complete, which can then be snuffed out by closing all the vents. 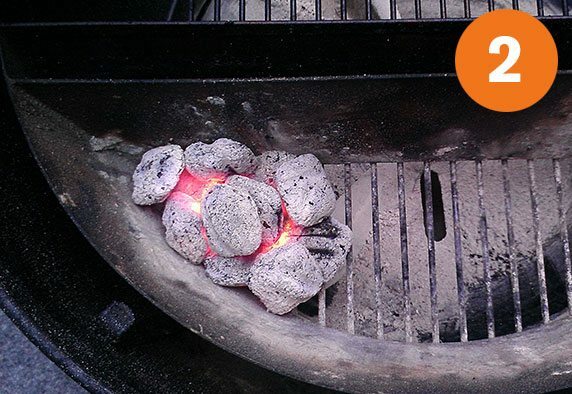 Partially-spent coals can easily be relit and reused on the next cook! Open the top and bottom vents of your kettle grill fully open. 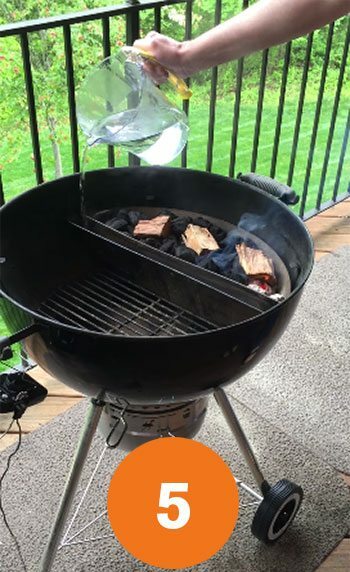 Allow the temperature to rise to approximately 275 (as measured only by a good digital thermometer probe placed at grate level, not your grill’s lid thermometer!) then close the top vent to about 1/3 and the bottom vent to about 1/4. The time it takes this to happen will vary from place to place and with weather conditions of your area. On a calm sunny day with temperatures of 75 F for example, this may take about 15 min. Some adjustments will likely be necessary depending on wind, air temperature, rain, etc, to maintain your target temperature. If your grill goes above 325 this is ok, but make only minor adjustments to lower the temp. 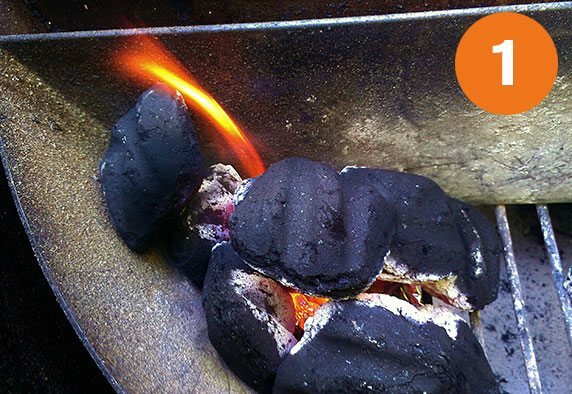 Charcoal requires oxygen from the air to combust and make heat. Our vents regulate how much air we allow the coals to receive. This process takes time, both in raising and lowering the temperature. Make very small vent adjustments, and allow 5-10 minutes for these changes to affect the temps. Do not expect instant results as if adjusting a gas burner. Do not simply take the lid off to lower the temperature, as this will only temporarily work. You’ll soon find the temp will climb even higher due to the large supply of fresh oxygen this adds into the grill. Resist the urge to make large adjustments if your temperature goes too high or too low. Remember, when cooking “low & slow” @ 225 you do not have to maintain 225 precisely for great results. We want to try to stay within a range of 200-250 degrees, with our target being 225. Similarly, when cooking “hot & fast” @ 325 we do not have to maintain exactly 325. A good range is 325-350. Too much higher than 350 can cause sugar in various rubs to begin to burn. This varies with different recipes and blends used. A little variation is normal and will not harm things. The more you cook with your kettle and your Slow ‘N Sear and follow our lighting guidelines, the more familiar you’ll get with your grill and your vents and how it reacts to adjustments. Soon you’ll know automatically what needs done, and your temps will hold remarkably steady.